DV Hardware - bringing you the hottest news about processors, graphics cards, Intel, AMD, NVIDIA, hardware and technology! There are currently 74 people online. 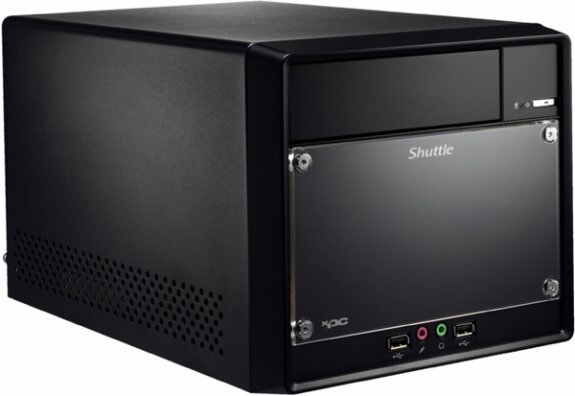 Shuttle presents the XPC Barebone SH61R4, a new barebone system with Intel's H61 chipset. Shuttle Computer Handels GmbH, European subsidiary of Shuttle Inc., one of the leading developers and manufacturers of compact PC solutions such as the world-renowned XPC Mini-PC Barebones, today announces the sales launch of a Mini-PC for second-generation Intel Core processors. The XPC Barebone SH61R4 establishes itself as a highly efficient Mini-PC platform for cost-conscious users. It is suitable for all new second-generation Intel Core processors (i3/i5/i7 for LGA1155) as well as energy-saving DDR3 memory and boasts a particularly well-balanced performance/energy consumption ratio. Effective cooling is managed by a system comprising several heatpipes and a large, speed-controlled fan for optimal smoothness when running. The Intel H61 Express chipset features new, energy-efficient technologies and innovative functions such as USB 3.0. Two digital monitor connectors (DVI-I, DVI-D) on the rear can be controlled by the graphics function integrated in the second-generation Intel Core processors - without any add-on graphics card required in the PC. Should advanced graphics performance be needed, a dual-slot graphics card can be added using the PCI-E-x16-2.0 slot. There is one PCI-E-x1-2.0 and Mini-PCI-E-x1-2.0 slot each for other expansion cards. The compact aluminium case with its 250 Watt power supply unit has space for three drives; an optical 5.25" drive and two internal 3.5" drives (e.g. SSD and hard disk). On the front and rear there is a total of ten USB ports with two of which being USB-3.0 standard. The SH61R4 also features Gigabit LAN and 5.1 Audio. A serial port (COM) can be installed optionally. 300 Watt and 500 Watt power supply units are sold separately. "With its all-round compatibility, its performance can be adapted at any time to suit individual needs," says Tom Seiffert, Head of Marketing & PR at Shuttle Computer Handels GmbH. "The R4 model also has the same front panel as the J4 that allows for creating personal front designs easily." Shuttle's recommended retail price for the XPC Barebone SH61R4 is 172 Euros (ex VAT). All logos and trademarks are property of their respective owner.